making: ROBYN'S FETISH CHALLENGE # 218 "STRIPES OR DOTS"
Happy Sunday!! It hasn't been to bad here. Trying to get use to this rain today. My husband is only home on the weekends now and we still have not been able to spend time together. So, with it raining outside maybe we will get some time to be together. If anyone has girl teenagers you might know what I'm talking about. Dating. Something that my husband absolutely will not discuss with me. If I make the decision and he didn't like it, I was wrong. She's really not into it yet but I would like to have my bases covered when it does come up. Hopefully I can get that out of him. I am so excited for this week's challenge. When I seen what it was and the image that I was able to use, I knew what my project would be. Our sponsor this week is Broken Box Stock. They have many categories you can choose from and even have digital paper. The images are absolutely great. So, the image that I used is called "Soccer Star Toodle." When I seen soccer, I was going to make a scrapbook layout of my daughter. This image is absolutely cute. She is ready to play. She has a number 1 on her shirt but I did change that. My daughter's favorite number and soccer number was 9. So I found a 9 and put it on the shirt. She actually noticed that I did that. So, let's see what Broken Box Stock is giving to our lucky winner. Let's get to my layout now. 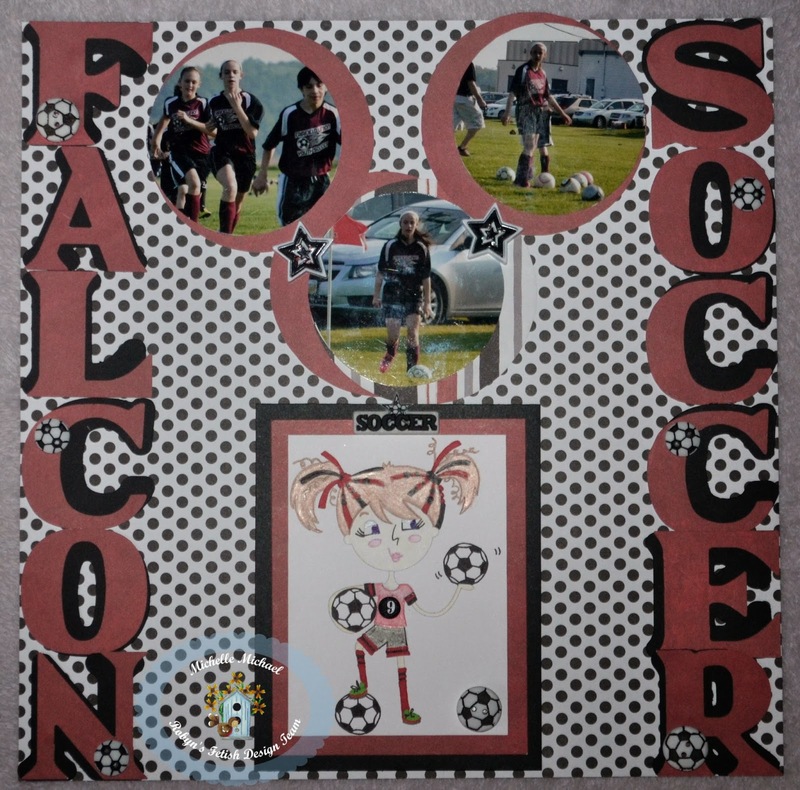 This layout is called Falcon Soccer and I used the school colors of black, red and white. I did use the dots for my background. I think the number 9 jumps off the page. I used pictures of them practicing because some of the ones when she is playing you really don't notice it's here unless you know her. Here are the items that I used to make her layout. I have my cricut machine now so I hope I learn more to use for my projects. I really hope you like this layout. Of course, it's going into our family album. Thank You so much for reading my post. Please feel free to leave any comments about the layout. Robyn's Fetish Challenge Blog is the place to be if you want to add your project this week. Hope you all have a great week and come back tomorrow to see another project that I have done.